I have always been drawn to sacred places, whether they are recognised by organised religions, like churches and mosques, or places of a more ambiguous nature such as stone circles and mountain tops. I began to realise that I felt more complete and became calmer as I visited these places. In the last couple of years I have had the chance to undertake a long pilgrimage through many sacred places of Europe. It has been a life-enhancing experience for me. It has strengthened my spiritual understanding and deepened my connection to the earth. It has given me a profound sense of satisfaction and joy. The physical act of progressing from one place toward another of significance, concentrates part of the mind on the bodily struggle involved; the rest of the mind appears to dance in a kaleidoscopic meditation. This tiring out of the body whilst freeing the mind seems to quench a deep thirst within the human heart. 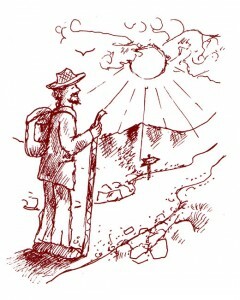 I think in the busy, hectic world we have created, many of us benefit from stepping sideways into pilgrimage. We can relate to our planet Earth in two ways: either we can act as tourists and look at the Earth as a resource of goods and services for our use, pleasure and enjoyment. Or, we can act as Earth Pilgrims and treat the planet with reverence and gratitude. Tourists value the Earth and all her natural riches only in terms of the usefulness to themselves. Pilgrims perceive the planet as sacred and recognise the intrinsic value of all life. The living Earth is good in itself with all its grace and beauty. Tourists find gratification in consumption of nature’s gifts. Pilgrims find enchantment in the conservation of nature’s bounty. The abundant waters of the oceans, the vibrancy of forests, the community of dancing birds, the tranquillity of valleys and the resilience of magnificent mountains brings a sense of joy, awe and wonder to the hearts of Pilgrims. For them, god is nature and nature is their god. Nature is their teacher, their guru and their guide. Sometimes they call her Gaia, the Earth Goddess, and at other times they call her simply, Mother Nature. Indigenous people of the world lived and behaved as pilgrims. The Earth was their temple, their church and their mosque. They went into the wild for their vision quest. They sat under the trees for their prayers and meditation, they did not look up to the sky to find heaven, their heaven was here on Earth. St Francis was a pilgrim of this sacred planet. Wolves, birds and all other creatures were his kith and kin, the sun and the fire were his brothers, the moon, the stars, the wind and water were his sisters. For Hindus, god is not a person sitting in paradise. For them all life is imbibed with the divine. Everything from a blade of grass to the high Himalayas is permeated through and through with the sacred spirit. Hindus consider themselves to be pilgrims on planet Earth. In all religious traditions there are some special sacred sites, they are like the seven chakras or the acupuncture points of the human body. Pilgrims make journeys to these sites: the holy mounts of Kailash or Athos, the holy rivers of Ganges and Yangtze, Camino de Santiago de Compostela or the Isle of Iona are such sacred places. It is useful to make outer journeys in order to make inner journeys but the significant realisation of a pilgrimage is in the consciousness that the whole of the Earth is a sacred site. The Earth is a gracious host but are we prepared to be gracious pilgrim guests rather than mere tourists? How does Pilgrimage help the Earth? The old saying that every pilgrim leaves footprints of light that others might follow and add to is no idle saying. The earth can be turned into light through pilgrimage and there is a science associated with how this is done. Love is an energy and all things including ourselves are built out of energy… when we move we are , in effect moving energy fields. Energy fields affect each other. If our energy is loving, then we affect other energy fields that we touch or move in with that love. We can share that love. We can both give and receive love, in mutual benefit. In such a way a pilgrim’s relationship with the earth, with the landscape can be a loving relationship. Just like us, the earth longs for such love and calls us to love her. The earth in her love for us helps us towards illumination and we can help her towards hers. That is the hidden purpose of pilgrimage – the so-called redemption of mankind and nature, the raising of all to light, wherein light is the manifestation of love.